This is a great book that includes info about RADIO RIOT (1949) and Harry Von Zell, as well as all the other comedians at Columbia Pictures' shorts department. 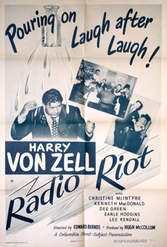 RADIO RIOT (1949) was Emil Sitka's thirty-first Columbia Pictures short-subject and his sixth with star Harry Von Zell. Von Zell had been a successful radio announcer prior to signing with the studio, and not coincidentally all of the two-reel comedies he made for Columbia involved various radio shows and had him playing a radio announcer. Although his comedies were popular, after making eight shorts for Columbia, Von Zell was ready to move on. 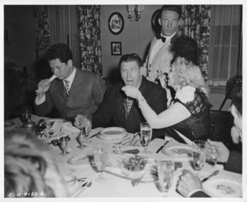 He subsequently landed a career-defining role in THE GEORGE BURNS AND GRACIE ALLEN SHOW, a ground-breaking hit television series he appeared in from 1951 through 1958. Von Zell appreciated the beneficial effect the Columbia shorts had on his success, and he attributed the exposure he received from them to his affiliation with Burns and Allen. 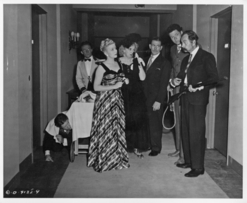 Emil worked well with Harry Von Zell and appeared in all eight of his starring films at Columbia. 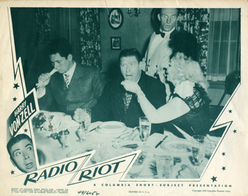 Written by Ellwood Ullman and originally titled HER MISLEADING MAN, RADIO RIOT features regular Stooge supporting actors Kenneth MacDonald, Christine McIntyre, and Dee Green, who are joined by Earl Hodgins and Lee Kendall. This short is one of quite a few that don't seem available for viewing anywhere, so here's a description of it from the script. MacDonald plays Von Zell's boss at a small radio station and in order to land a big contract he demands that Harry "be nice" to a millionaire client and his hillbilly family. Although Harry already has a fiancee (played by Christine McIntyre), a "misunderstanding" has the rich hillbilly's daughter (Dee Green) thinking that Harry's proposed to her. 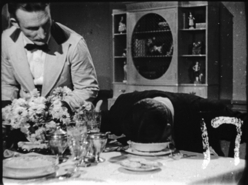 When he tries to get out of it, the hillbillies threaten Von Zell with either a shotgun wedding or a quick lynching. By chance, the hillbilly family and Harry's fiancee are not only staying at the same hotel but their rooms are right across the hall from each other. To make matters worse, the family and the fiancee both order dinner to be served in their rooms at the exact same time, and Harry's expected at each one. Emil plays "Joe, the waiter" who is assigned to serve both dinners, alternating between the two rooms across the hall from each other. 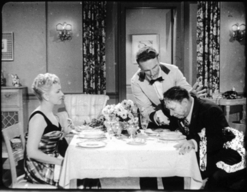 In a madcap frenzy, Harry scrambles between the two rooms trying unsuccessfully to appease both his fiancee who's hoping for a romantic dinner and the hillbilly family that's watching Harry with suspicion. My day's work at Darmour Studio for Columbia with Harry Von Zell was a delight and pleasure -- because -- I am acting. And I can act right through a malady, a body full of pain and aches -- and not show it, or even suffer to the extent of quitting. Amazing, but true. My present role is fairly lengthy because I'm a waiter called "Joe." My part is mostly for the purpose of adding high-class atmosphere and reacting to Von Zell's antics. 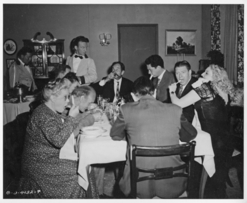 Again I'm happy, because I'm doing what my soul always seems to yearn for, I'm acting still in my role as waiter to Harry Von Zell in his comedy at Columbia's Darmour studio. And, as always, my work was perfectly timed, keyed, and tempoed. 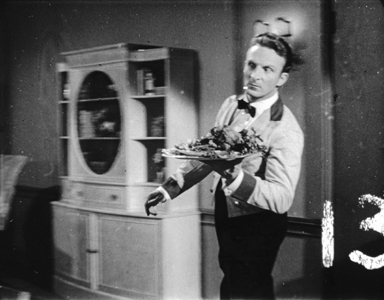 My role of waiter, called "Joe," was over at noon today - and Harry Von Zell promised me a photo of himself and seems very much to like me and my acting. Despite being a three-day job, Emil's role in RADIO RIOT was really another bit part and his name doesn't appear in the film's credits. He does appear in an inset photo on the one-sheet poster and shows up very clearly in one lobby card. A couple of weeks later however Emil got a call for yet another Von Zell comedy, but this time it would be for a co-starring role.